I was only half-joking. This line, from Rae Hoekstra of Made By Rae fame, is newly released, and I didn’t want to miss out. The colors are fabulous: watery blues of all shades, juicy tangerine, a preppy green . . . 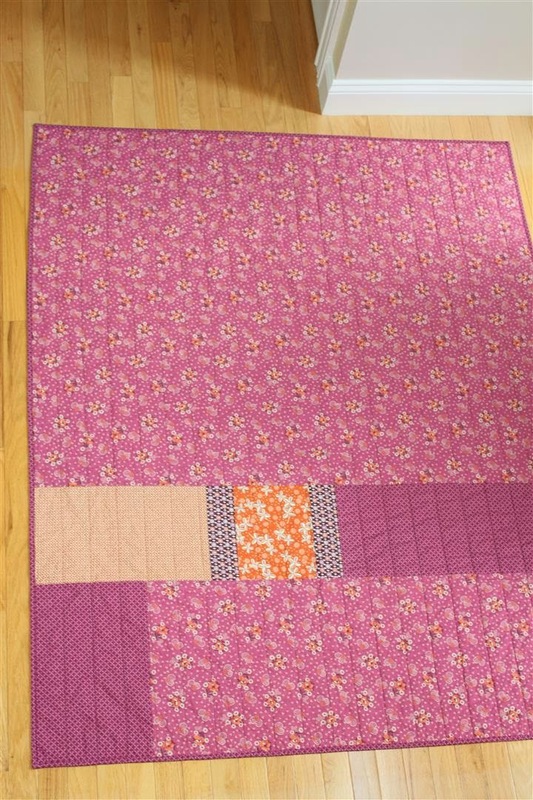 I purchased nearly the full line in half-yards with the intention of making a quilt. 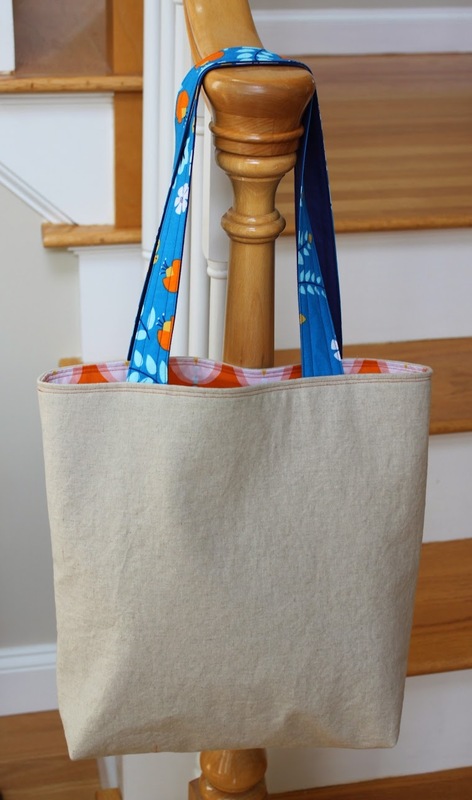 Which is why I’m surprised to unveil my Lotus Pond tote . . . I really loved pairing Lotus Pond with some Essex Linen. After finishing the bag, though, I looked at the back. BAH! A missed opportunity. If I could do it again, I would have used more Lotus Pond on the back. I won’t make that mistake again (oh yes, there will be another tote bag). As for the rest of my Lotus Pond prints, I don’t think they’ll be withering in my stash for long. I think there may be a quilt in there after all. 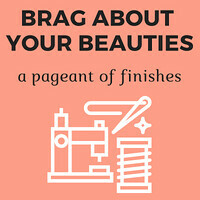 I’m linking up this post to Finish It Up Friday! I’ve been on a winning streak of late. I keep winning things. Quilting books, more quilting books, and most recently, many packs of precut mini-charms. Having a surplus of free stuff is a good problem to have, but I had never used precuts before and had zero idea what I should do with these mini-charms. I headed over to the Moda Bake Shop for some ideas. I decided to take on the Candy Scraps Quilt. Now I’m at a place I seem to reach with each quilting project: I like the pieced top, but I’m not sure how to tackle the actual quilting. I’m a straight-line quilter. I want to graduate to free-motion quilting. (I even have a quilt top that’s waiting for me to learn how to free-motion quilt.) Yet I’m stuck in straight-line land and never sure how to choreograph the quilting of a project in a way that adds to the finished product. A recent finish—my Hope Valley quilt—has probably my favorite quilting to date, and it’s plain, old stitching in the ditch, nothing you can really even see from the front of the quilt. So here’s what I’m calling my Farmer’s Market quilt. With its fresh colors and smaller size (it’s about 48 inches square), it’s the perfect quilt for sitting on and enjoying the entertainment at our local farmer’s market. If you take a peek at the original, you’ll see it has a distinct argyle feel to it. That’s cool. It’s just not what I’m going for. So how should I quilt this one? I’m thinking I’ll quilt in the center of each navy band with matching thread and then along the block seams, both vertically and horizontally, with a light gray. What do you think? Any suggestions? 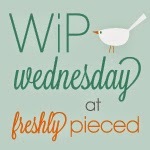 I’m linking up to Work in Progress Wednesday over at Freshly Pieced and looking for some advice! 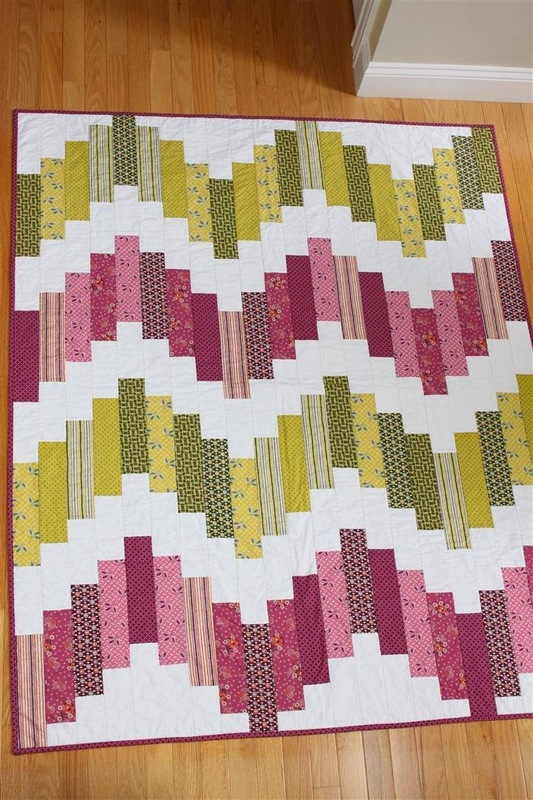 I can honestly remember the very moment the idea of quilting took root in my crafty head. I was shopping for—of all things—stationery and came across Denyse Schmidt’s What a Bunch of Squares notecards. I loved the graphic look of the collection, and it took me a minute to realize that the pictures were of quilts. It’s worth noting that through all of this, I was not quilting. At all. Sure, I was sewing, but I was strictly a bags-and-pillows-and-curtains girl. It wasn’t until 2013 that I decided it was time to make a decision: Was I the collector of quilting books, or was I a quilter?! Now, for quilt #7, I finally focus on my love of Denyse’s design esthetic, her singular talent for toeing the line between the old and new. Doing so required making a serious dent in my fat quarter collection from Hope Valley, and here is the result. When I first started quilting, friends advised me that my quilts would feel like my children and that it would be hard to part with them. That hasn’t been true for me until this quilt. I love, love, love it—it’s all mine. I curl up with it every morning when I have some quiet time before my boys wake up. I’m the mom to two little monkeys. My big guy is five, and my little guy is in the home stretch to age four. My five-year-old is notorious for being noncommittal (my almost-four-year-old is just notorious in general!). When asked, for example, whether he wants chocolate, vanilla, or chocolate chip ice cream, he doesn’t want to make a choice at all. Why can’t he just have all the options? It shouldn’t have surprised me, then, that this tendency would affect my plan to make him a quilt. When asked which colors he wanted me to use, he responded enthusiastically, “All of them!” And so the idea of my rainbow quilt was born. I’m not a rainbow-quilt kind of girl. The complicated rainbow and color-wheel creations of others at times amaze me, but I like a certain simplicity—visually—in my quilts. (Recently, that has meant breaking up colorful fabric choices with chunks of white.) 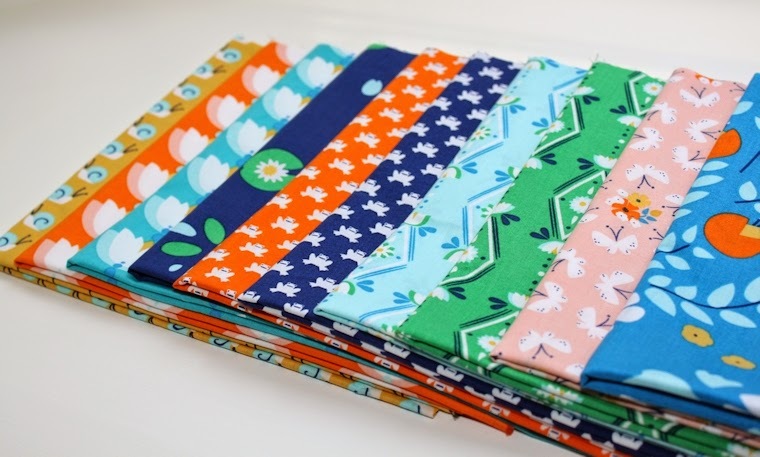 Using my scrap stash and purchasing as little additional yardage as I could get away with, I set myself to creating a boyish rainbow in six bold swaths of patchwork. I’m really pleased with it—and my son has already used it to build forts, to play superhero (it makes quite a cape), and to snuggle up under and watch a show. It’s my first stab at designing my own quilt top. 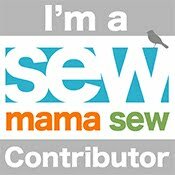 To celebrate, I thought I’d throw my hat into the Blogger’s Quilt Festival ring with it. Take a peek at the other submissions—the quilts on display there would shake anyone out of a creativity doldrums. Piecing a quilt top can be intimidating. After hours of cutting fabric and sewing the individual blocks, matching the seams up for a clean finished product can be a tiresome process—and it’s one that I’m still trying to perfect. At the end of it, however, you’re working with a big, flat rectangle. I like sewing rectangles; there’s safety in rectangles! Sewing clothing is a whole other matter. There’s little forgiveness in something you intend to wear for the whole world to see, instead of, say, something you fold up and let live on the back of your couch. 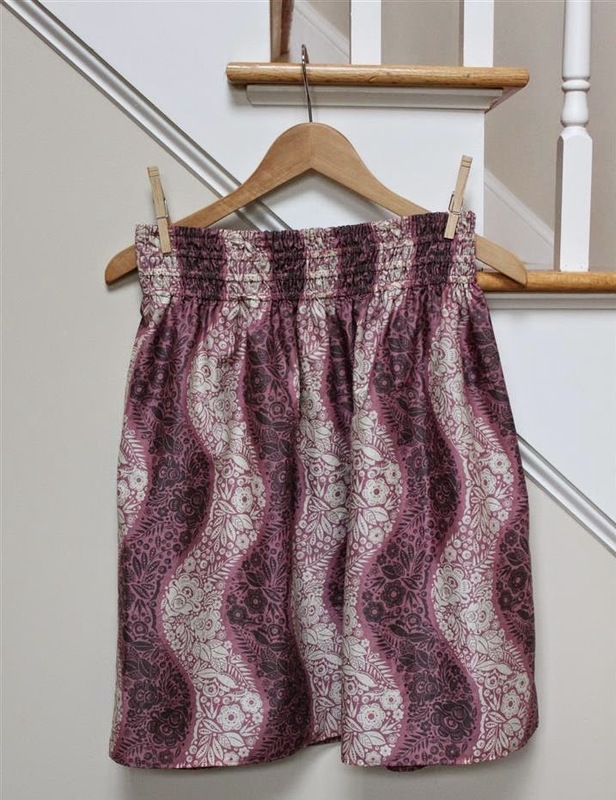 Following the lead of Rachel, of Stitched in Color, I faced my sewing-clothing fears and came up with a lovely version of Anna Maria Horner’s Flirting the Issue skirt, in some AMH fabric, no less. My foray into scarf making, however, gave me just enough extra fabric to tackle a Flirting the Issue skirt. Like the scarf, this skirt came together super fast. I wasn’t sure that I’d like the overall cut (I’m a tailored pencil-skirt kind of girl), but it works. And it’s crazy comfortable. 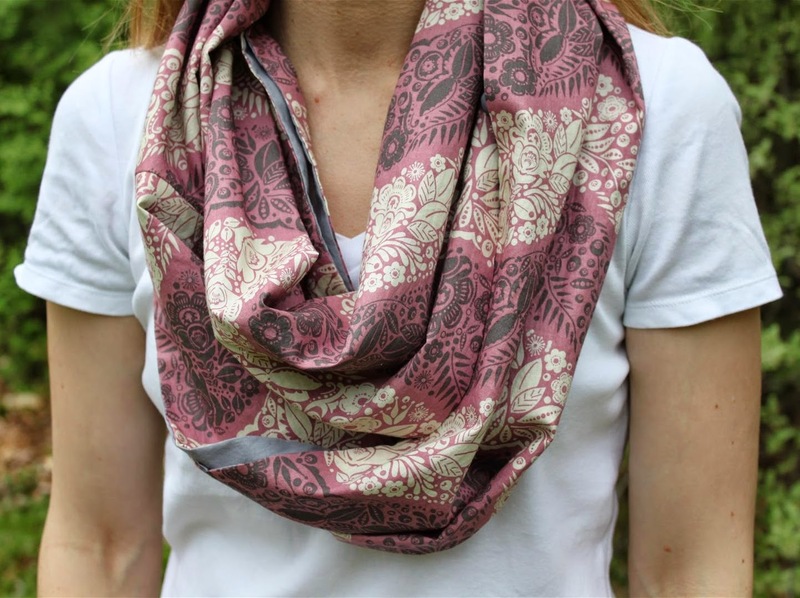 I used AMH’s Village Path, from her Little Folks line, in lilac. On the bolt the wavy stripes are horizontal, but for my skirt I oriented them vertically. I like it! What would I do differently the next go-round? (2) I’d consider finishing the seams. I’ll probably handwash this skirt anyway, which will reduce the wear on the seams, but it never hurts to make your seams as pretty—and strong—as they can be. 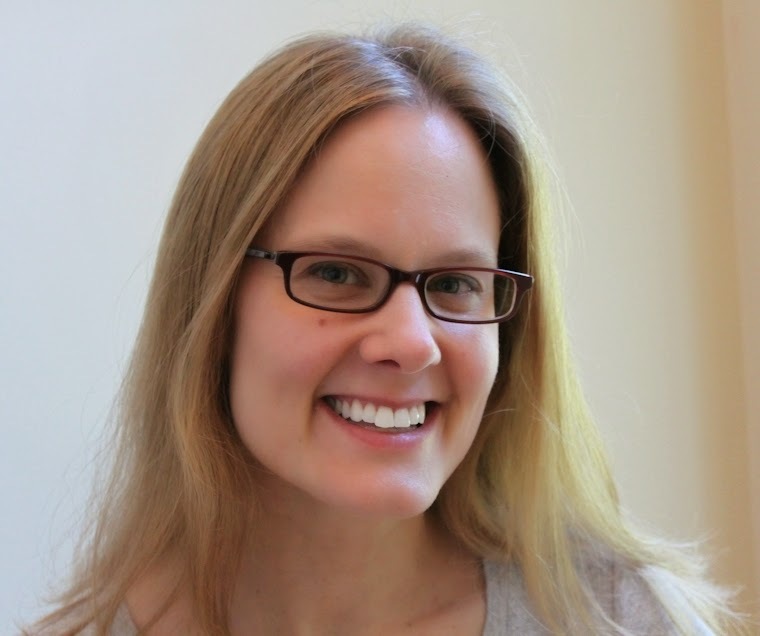 (3) I’d avoid rookie cutting mistakes! Sigh. I cut the back of my skirt six inches too short and had to sew on the difference, so there’s an extra vertical seam. At least you can’t see it unless you’re really looking. 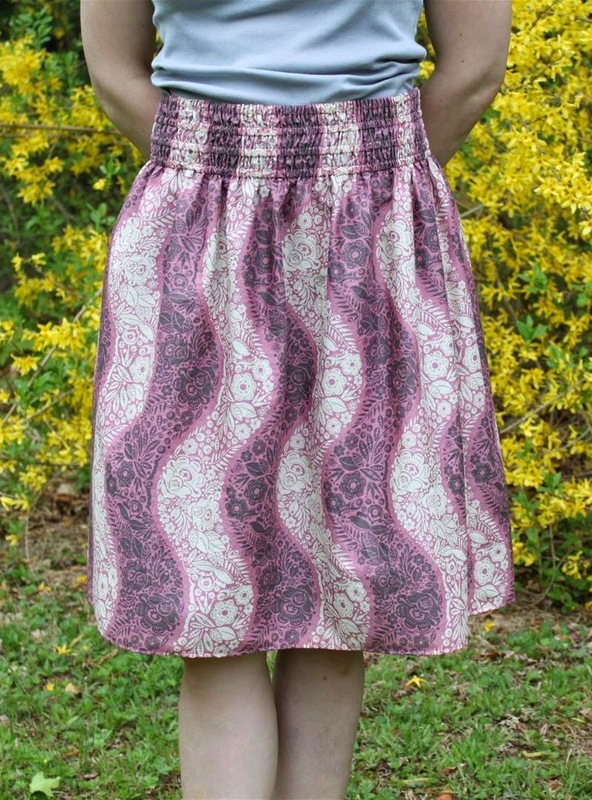 This project rejuvenated my interest in sewing clothes, but I truly need to wrap up some quilting projects. My skirt tangent has come to an end. Back to quilts! 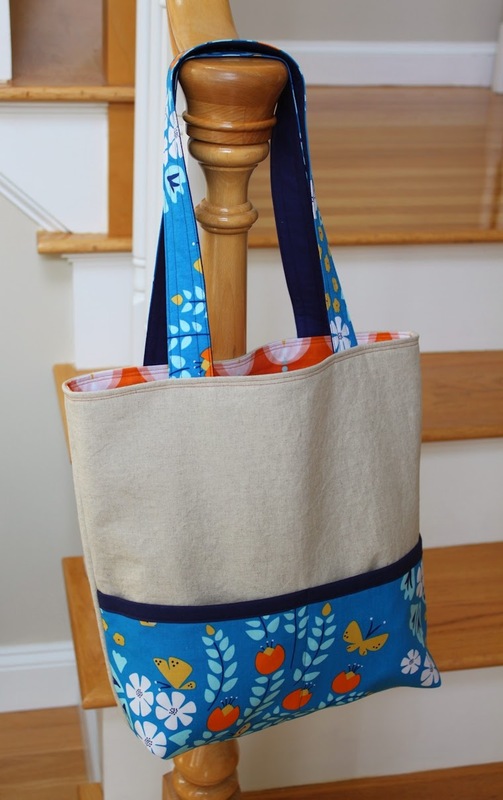 Yesterday, somewhere between the computer screen and the fabric stash and the sewing table, I decided it was time for an irrational sewing-project decision. I have plenty of items on my to-do list, so what’s another one? 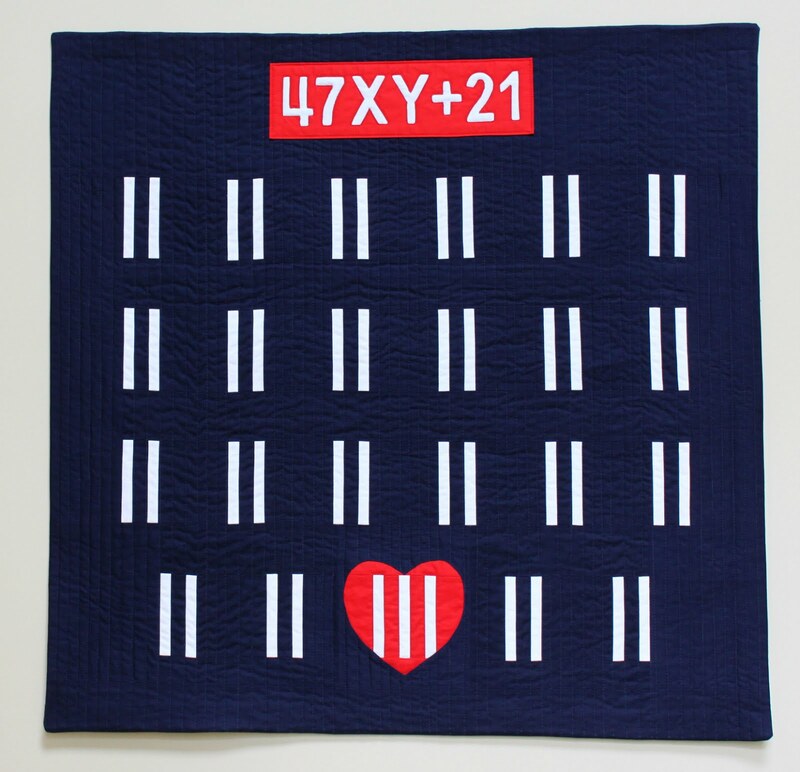 Exhibit A: The not-even-basted quilt for a Mother’s Day gift (note: the Mother’s Day that was four days ago!). Exhibit B: The barely started quilt for my brother-in-law’s birthday (note: the birthday that was four months ago!). Exhibit C: The somewhat-pieced top for a Christmas mini-quilt. For the record, this project is ahead of schedule—there’s something to be said for starting Christmas projects 10 or 11 months in advance. But yesterday, when I realized that I could still get in on the skirt-making action at Stitched in Color, I decided to set the quilts aside and see what I could do—in less than 48 hours—with the two yards of voile I already have on hand. Can I do it and join the link party on Friday, May 16? Time will tell . . .